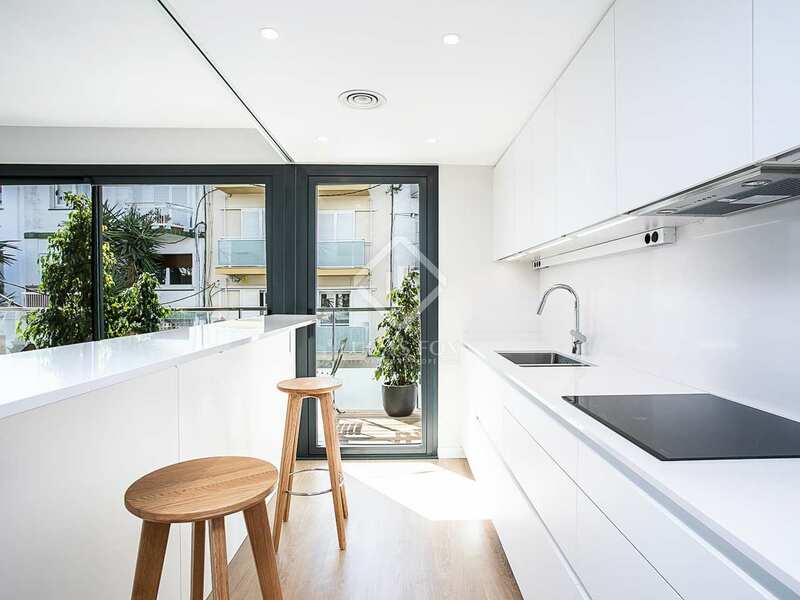 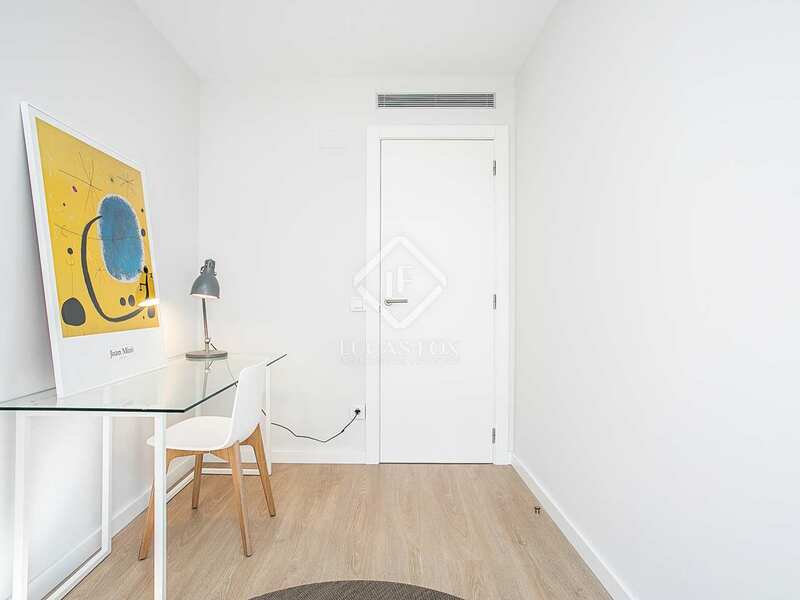 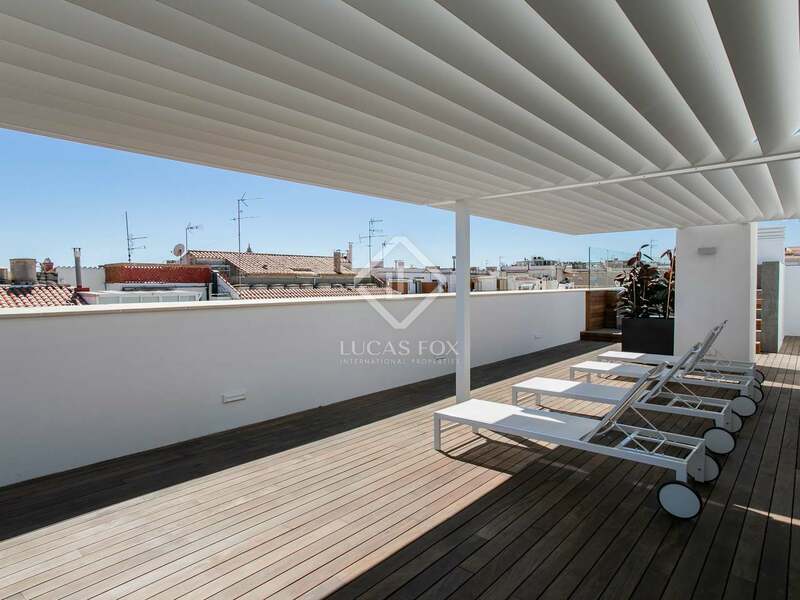 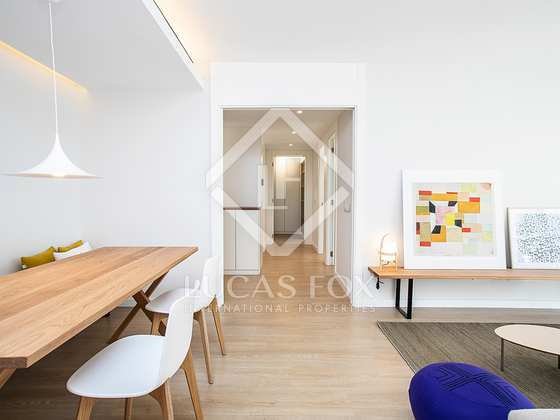 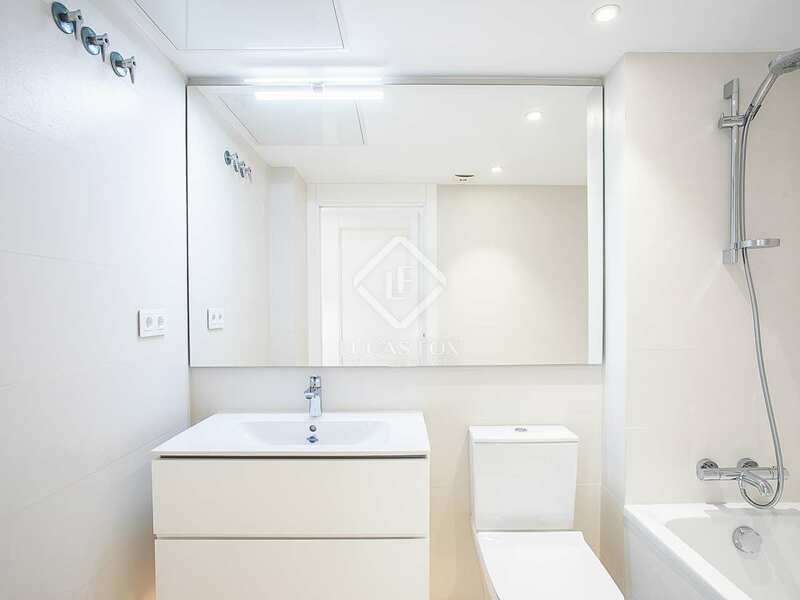 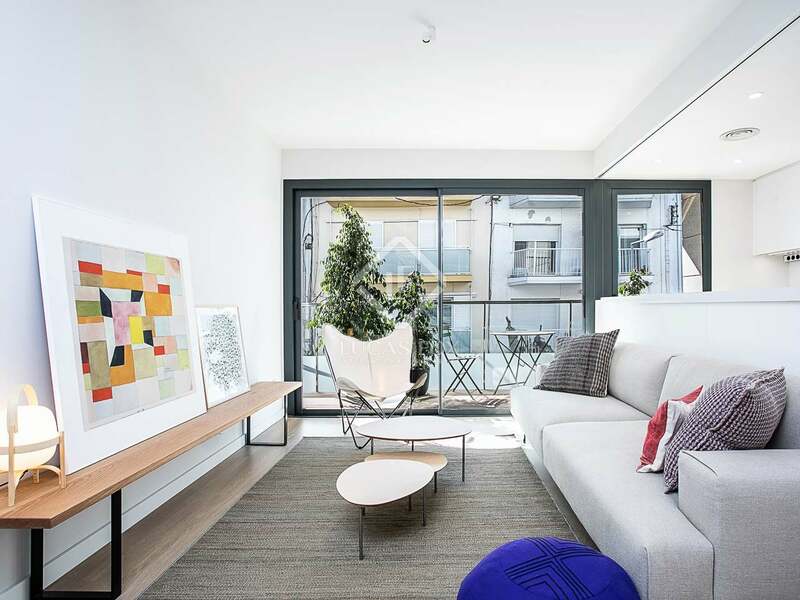 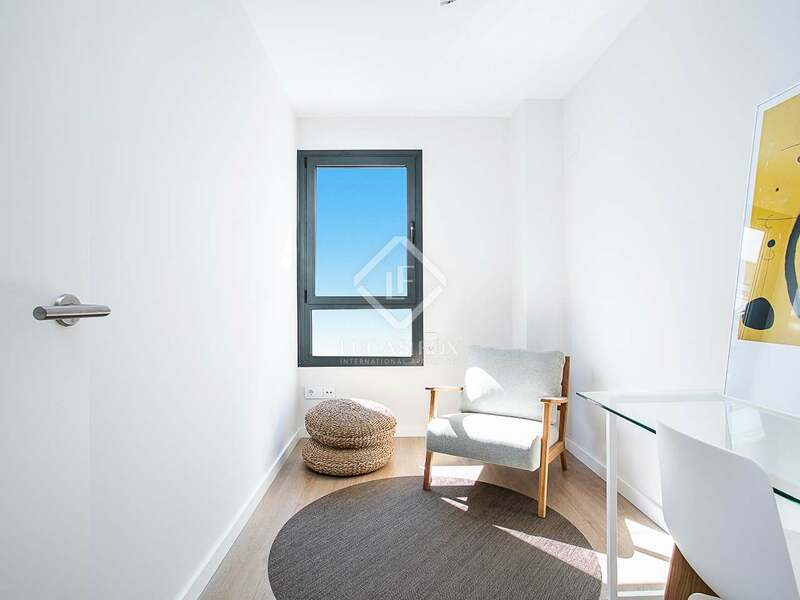 This property is part of the Maragall 7 Apartments, Sitges Town. 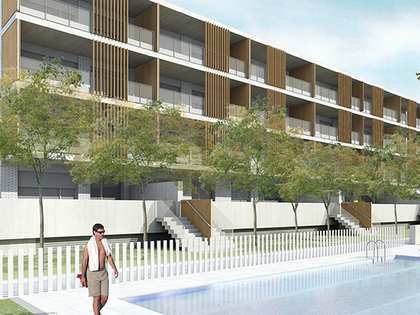 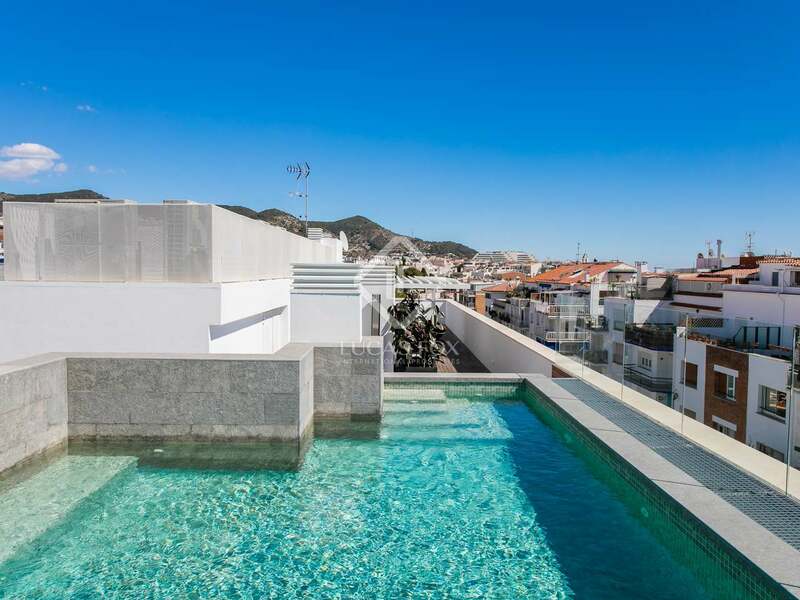 Brand new development in Sitges centre, 2 minutes from the beach, offering 18 apartments with terraces, rooftop swimming pool, fitness room and underground parking. 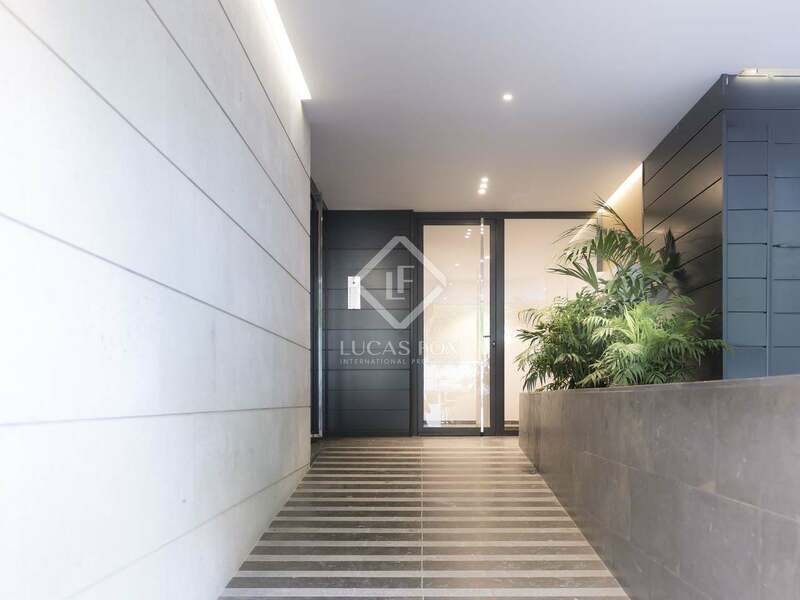 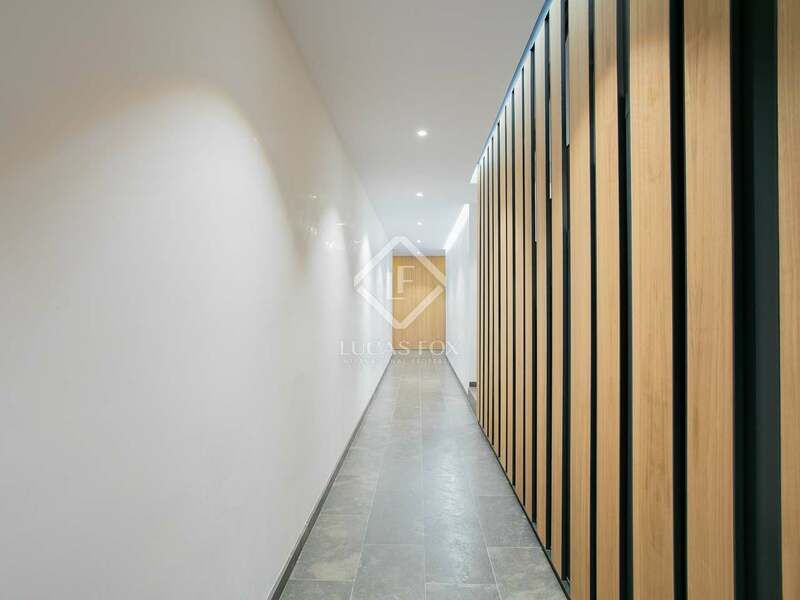 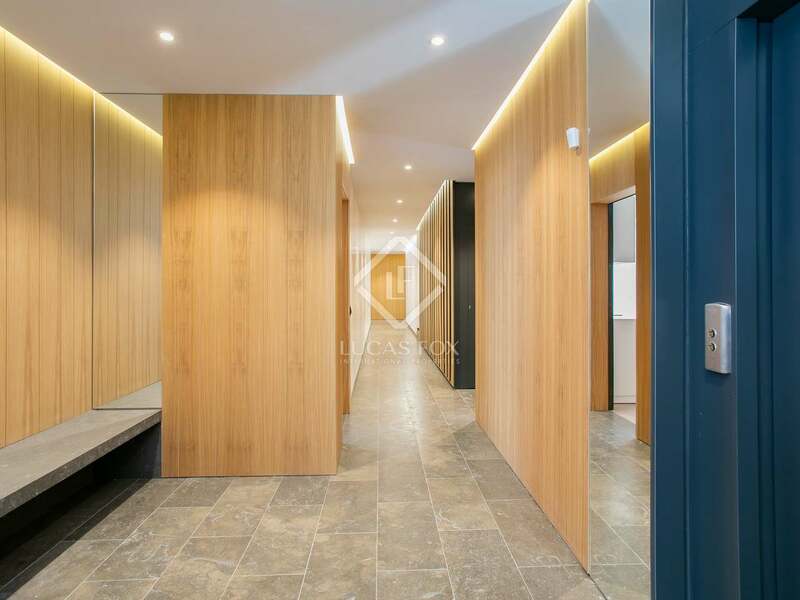 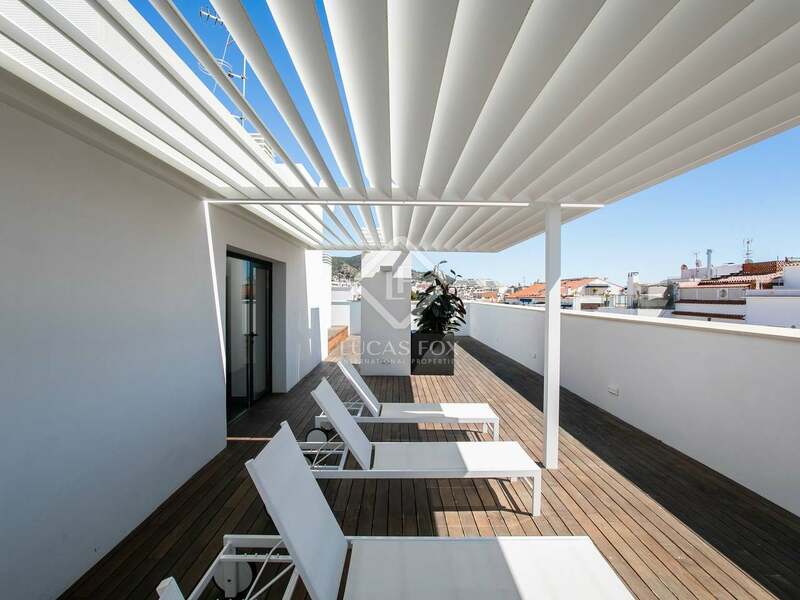 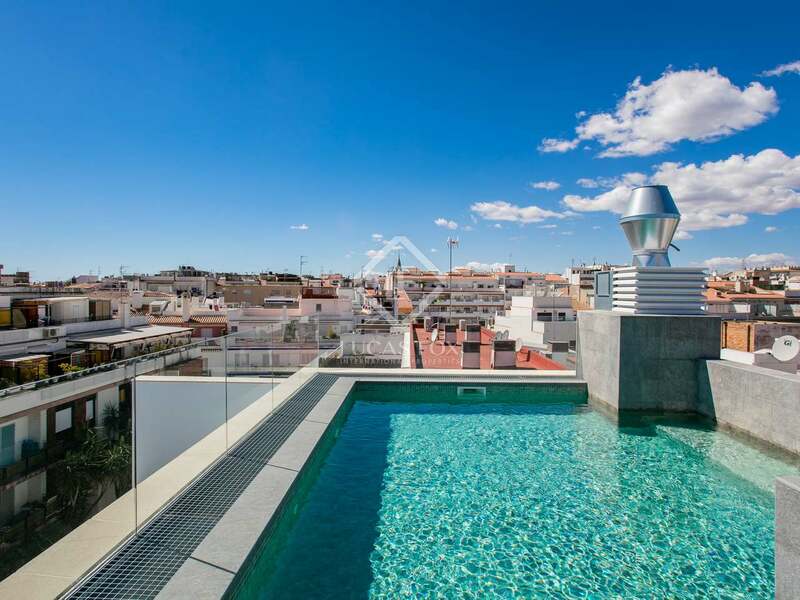 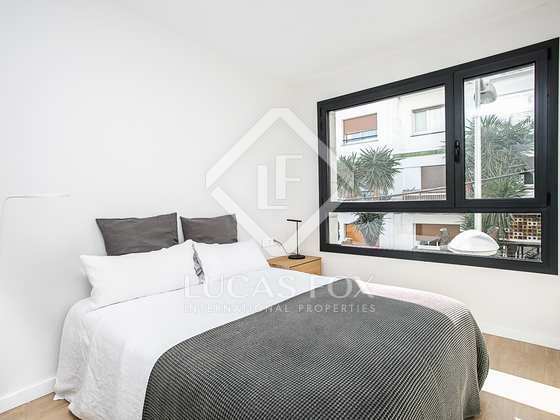 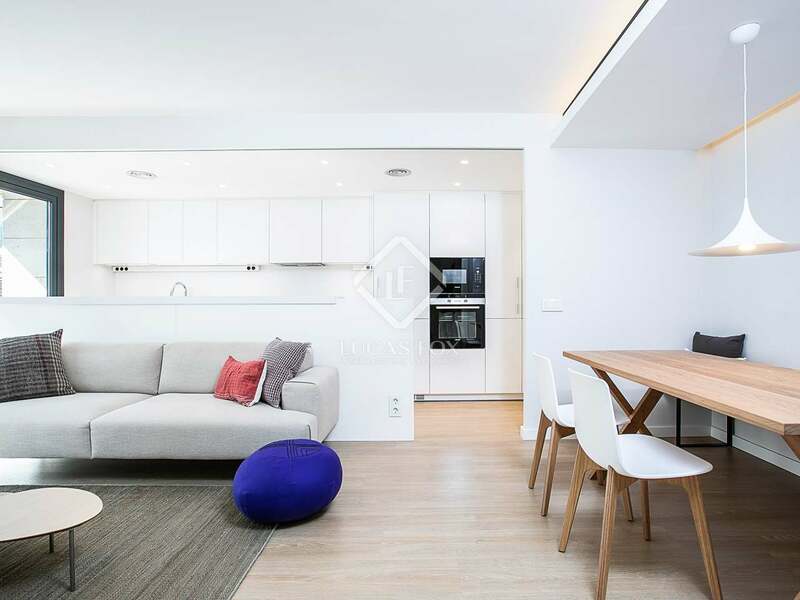 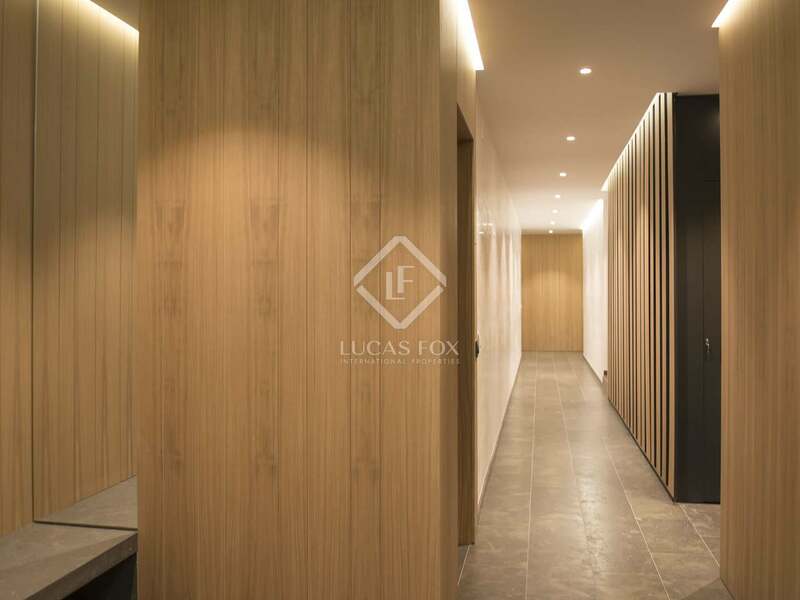 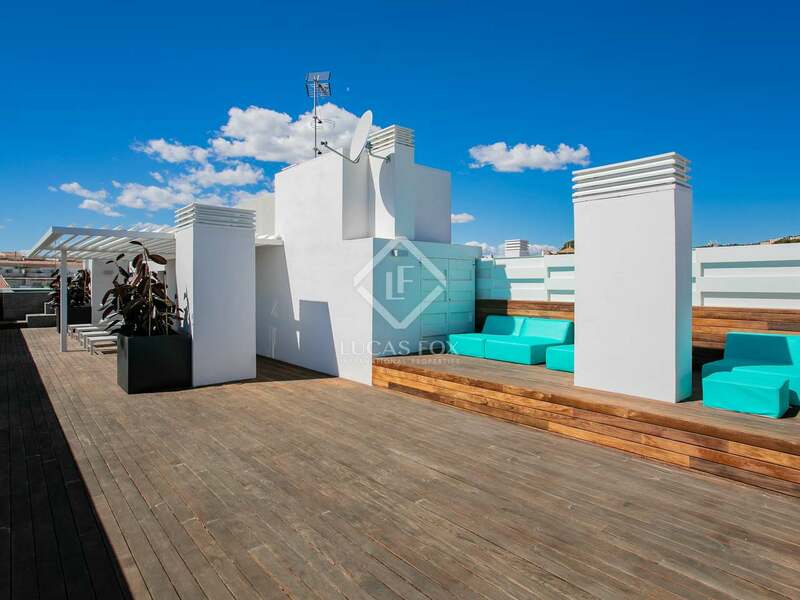 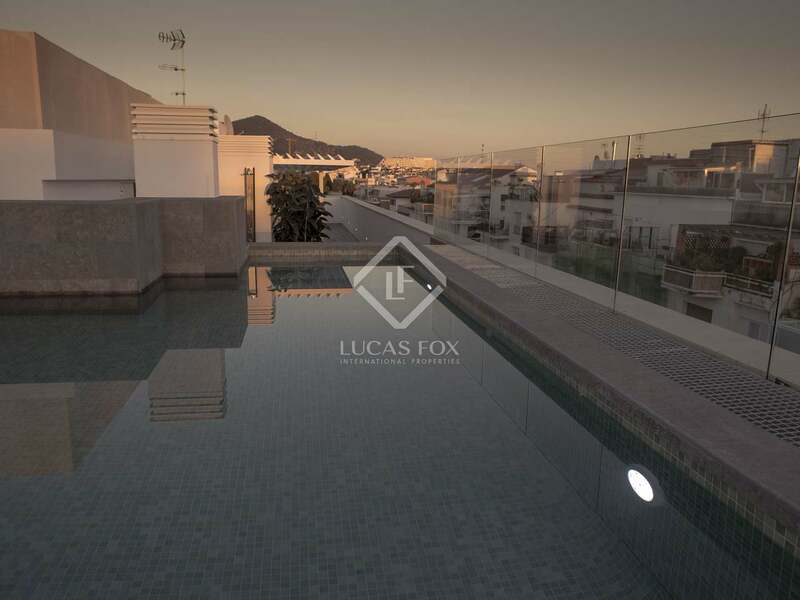 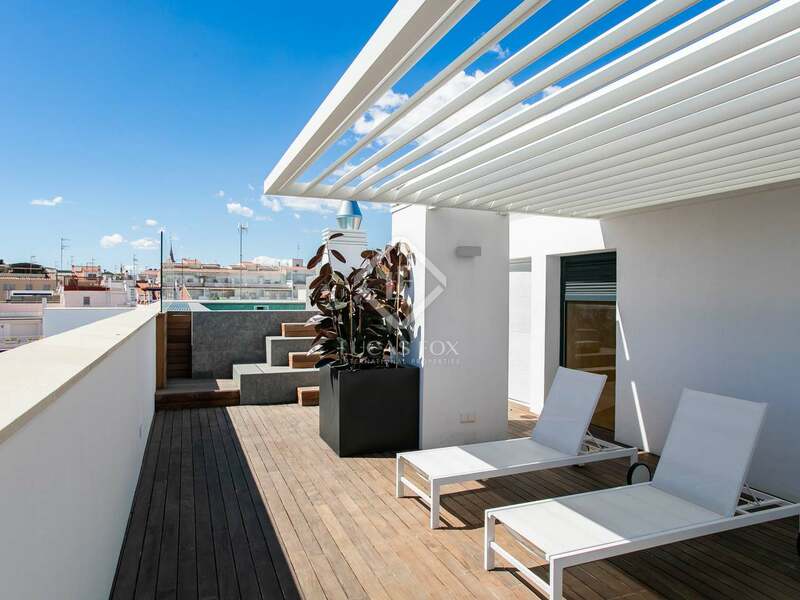 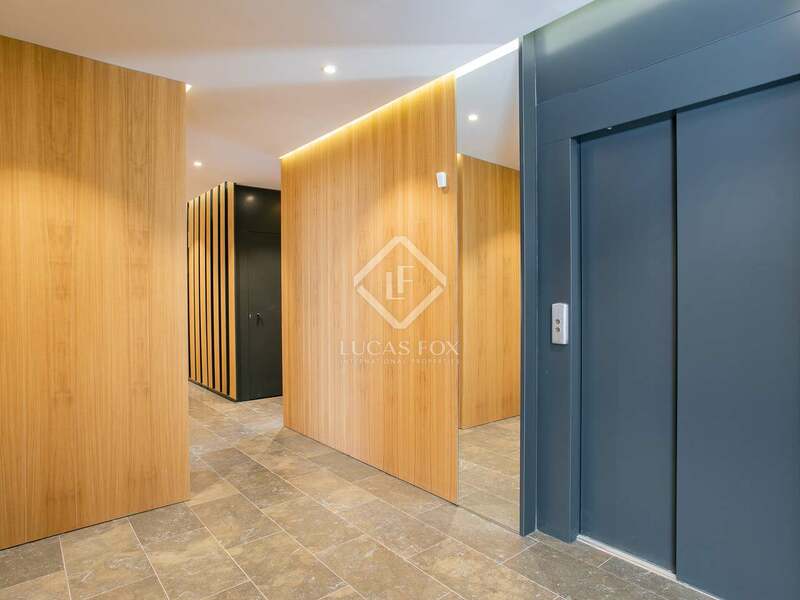 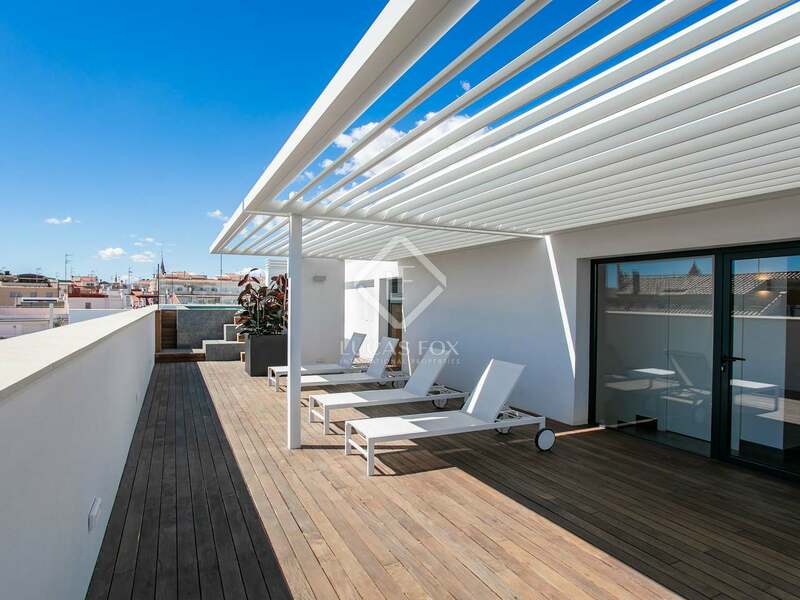 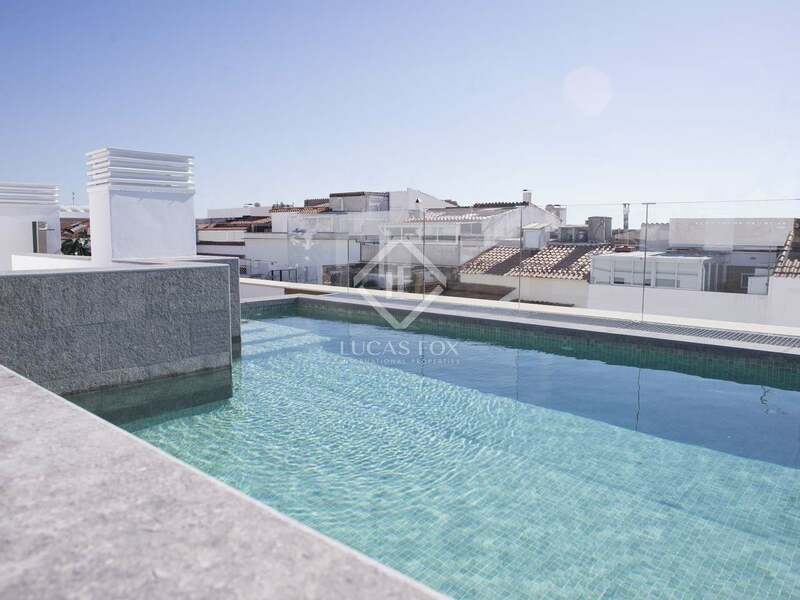 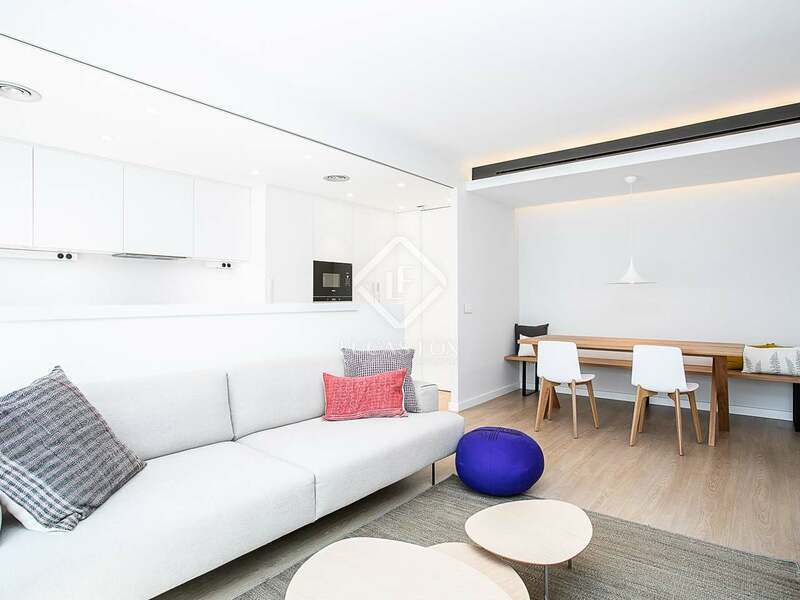 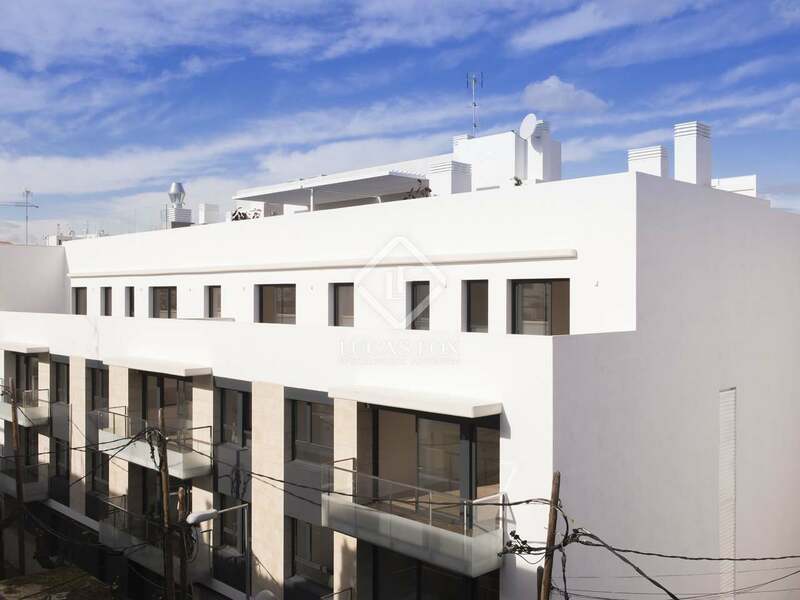 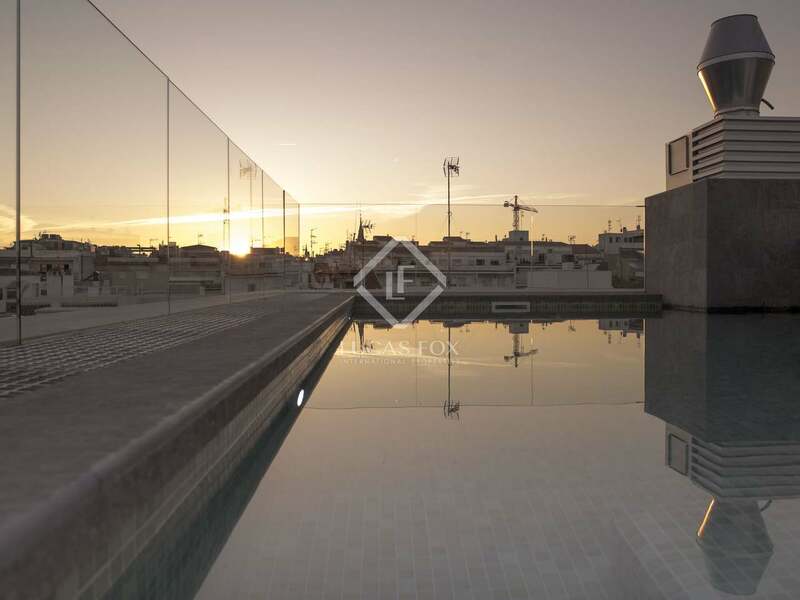 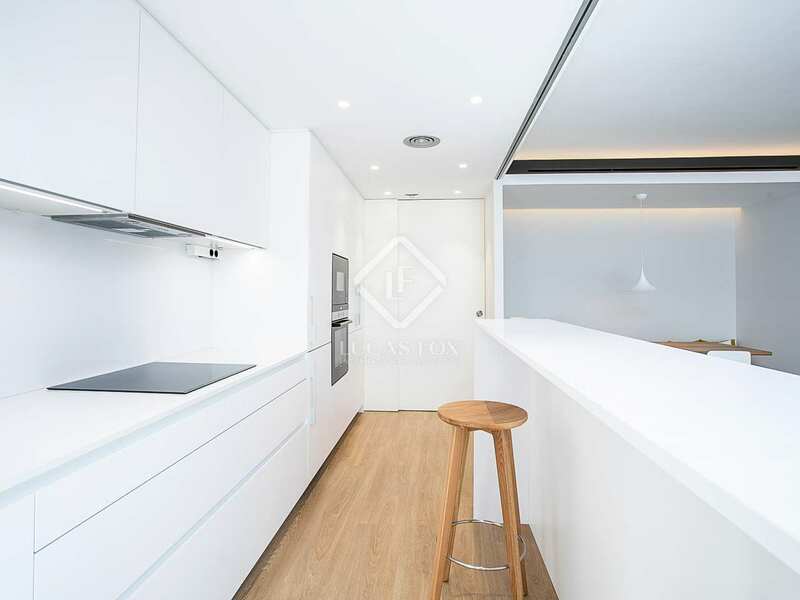 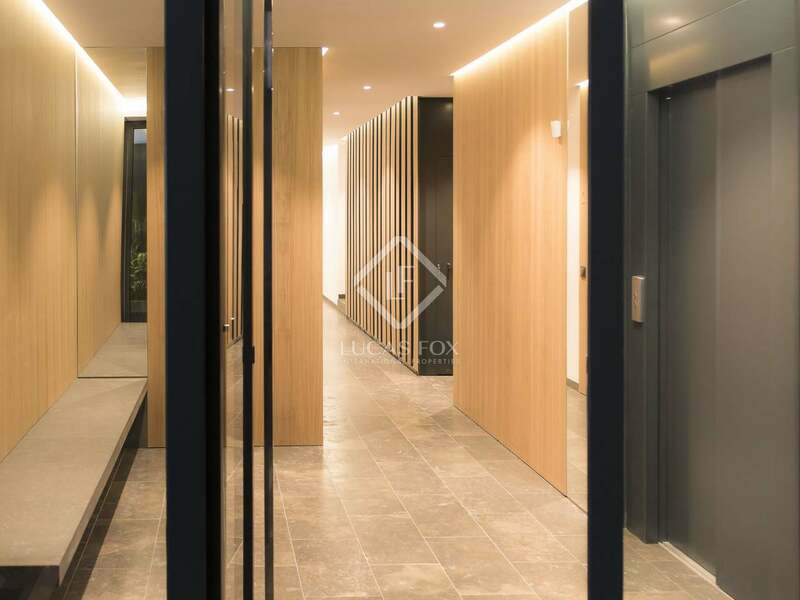 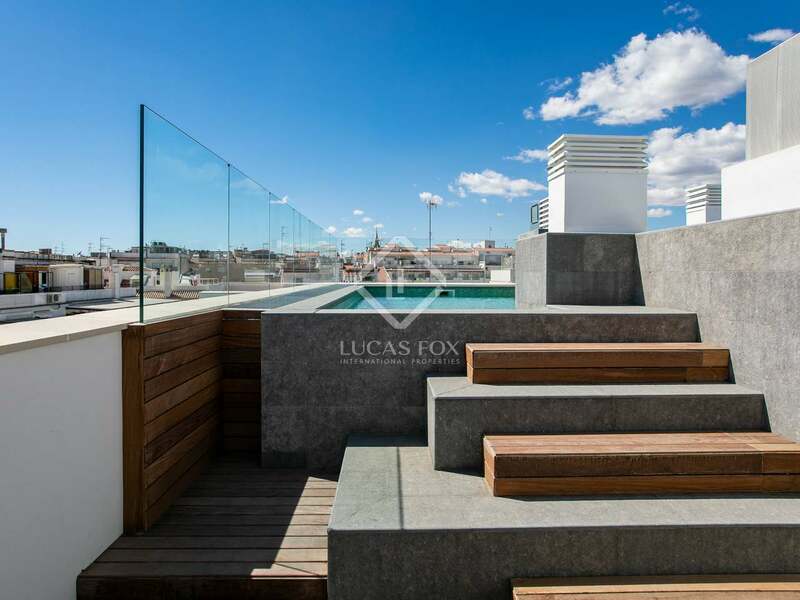 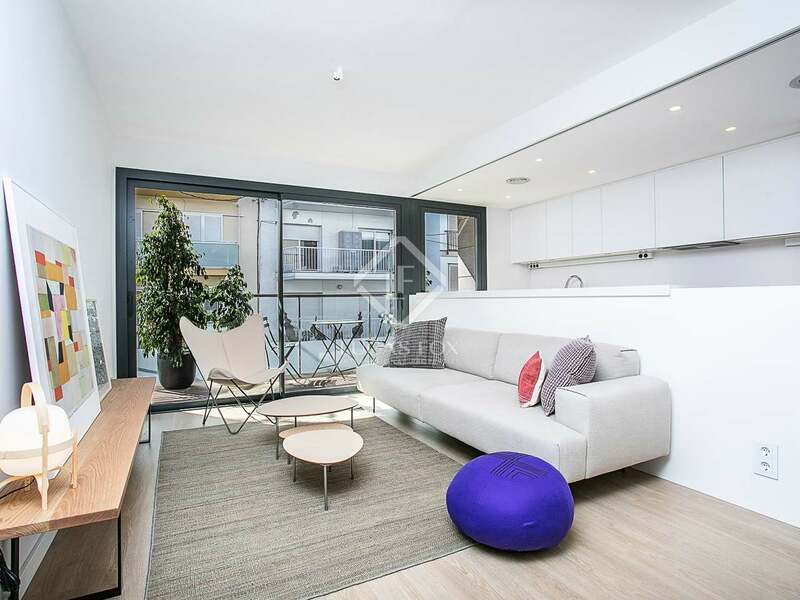 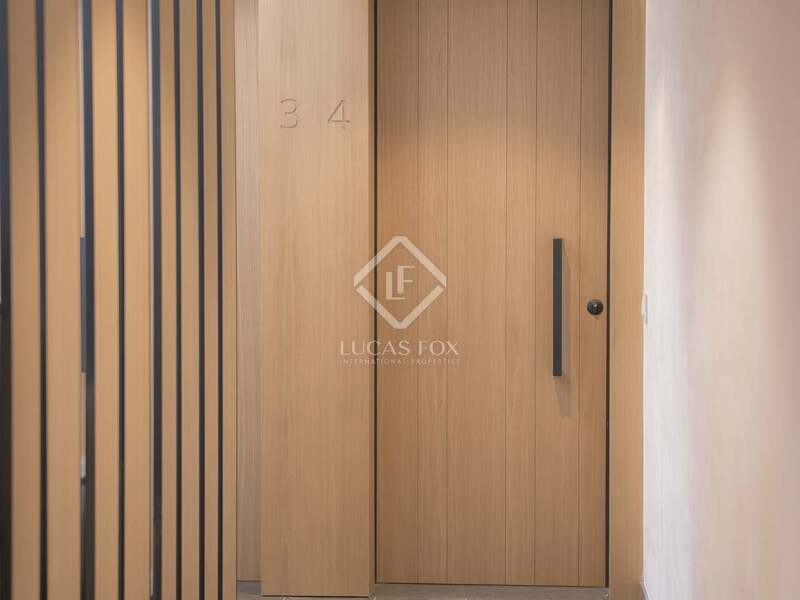 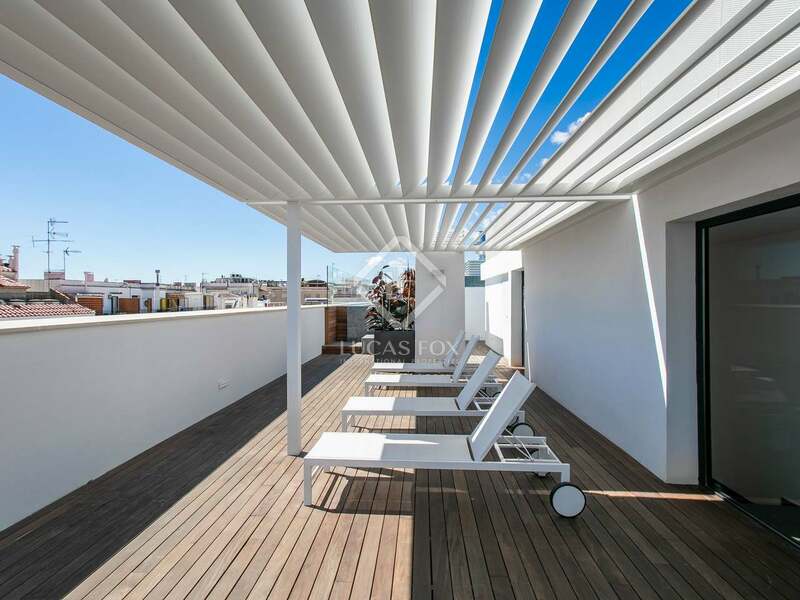 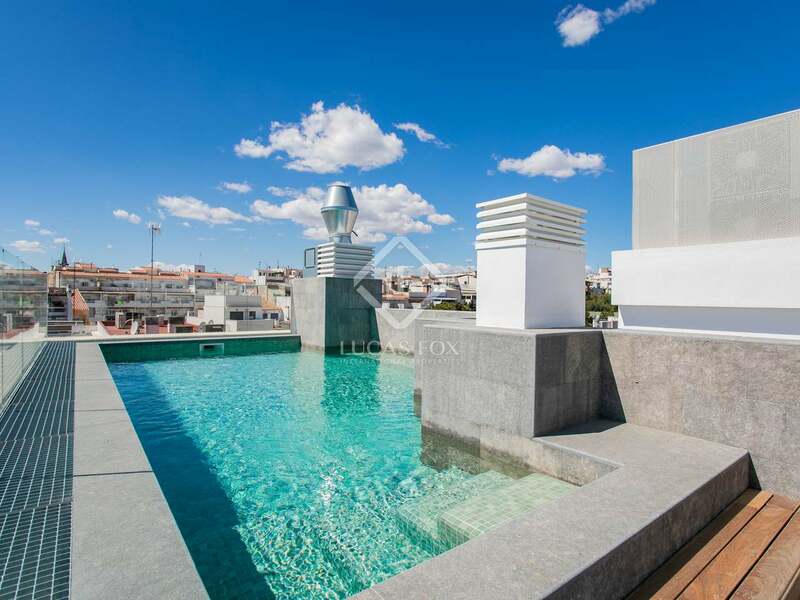 Stunning contemporary apartment in a fabulous new development of 18 apartments with a roof top terrace and pool, in a privileged, peaceful location just one street back from the beach, in Sitges centre. 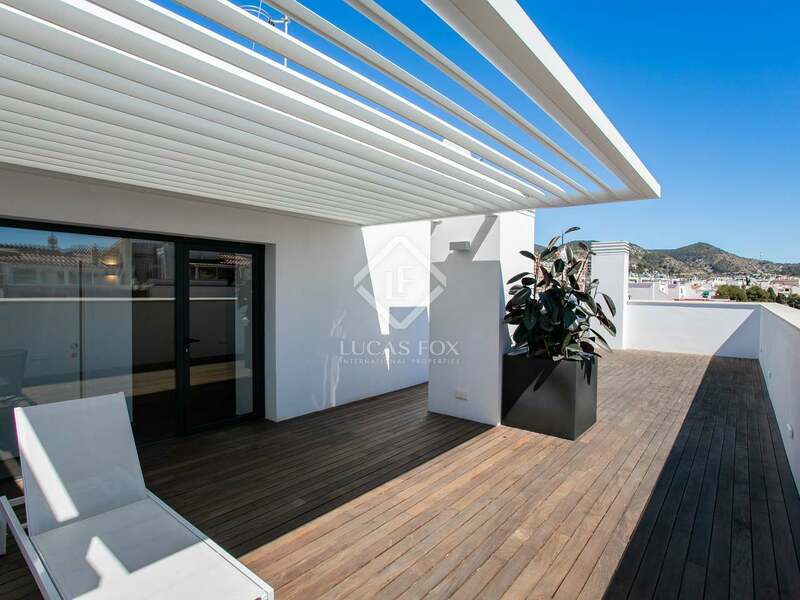 This bright and sunny south-facing apartment is the perfect place to make the most of the enviable climate in Sitges, thanks to the private terrace and beautiful roof top communal areas with a swimming pool and chill out spaces; all in a secure building with parking spaces and a small fitness room in the basement. 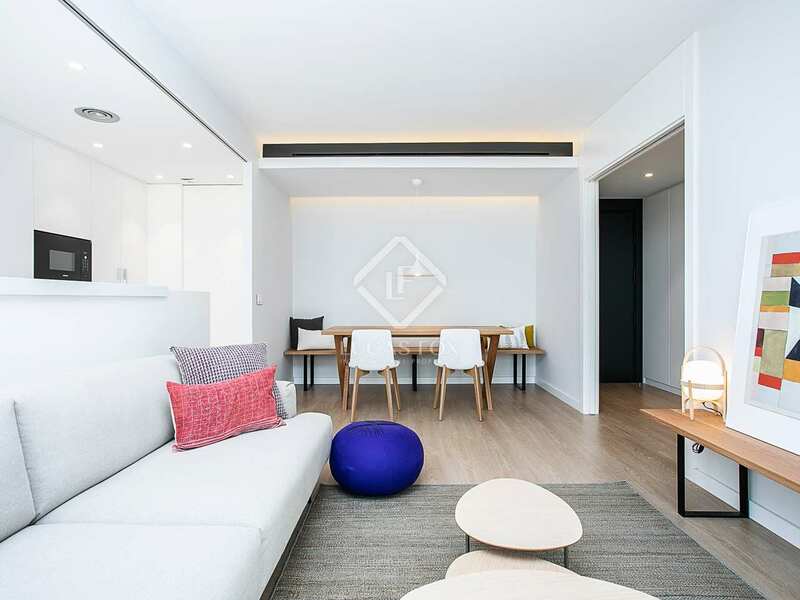 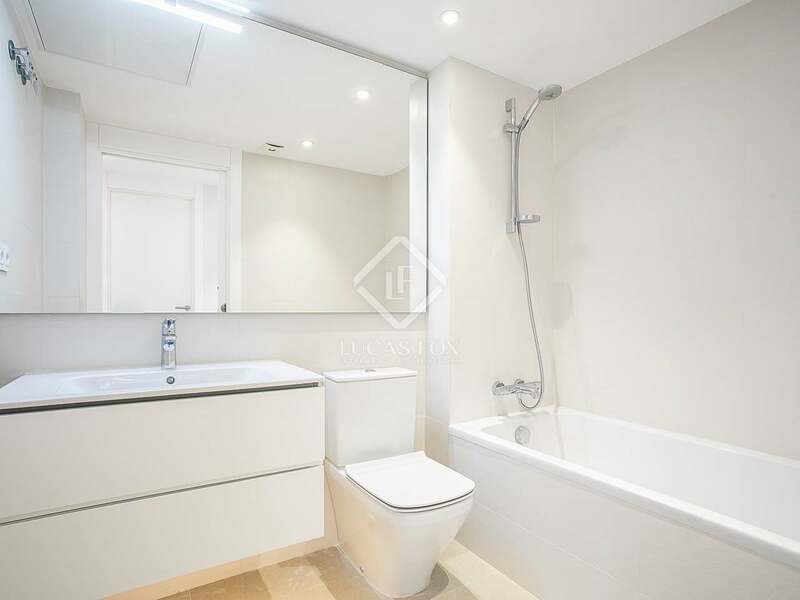 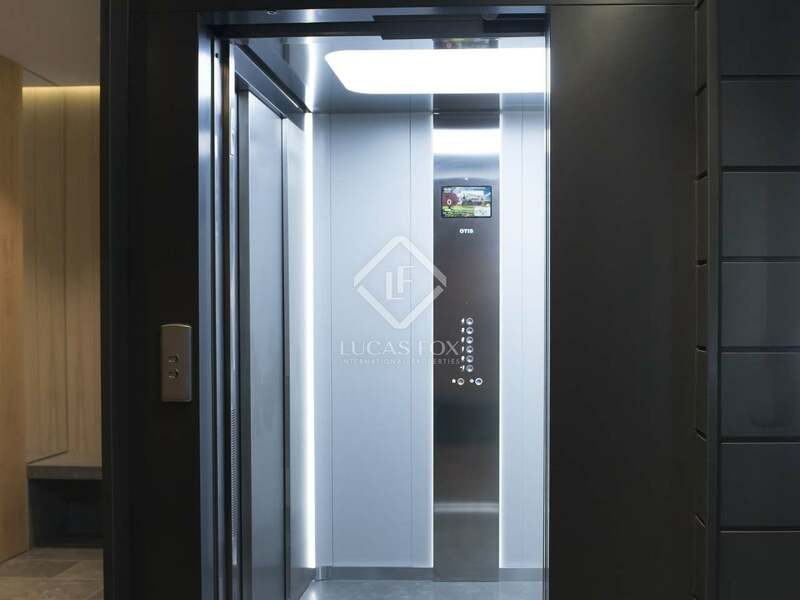 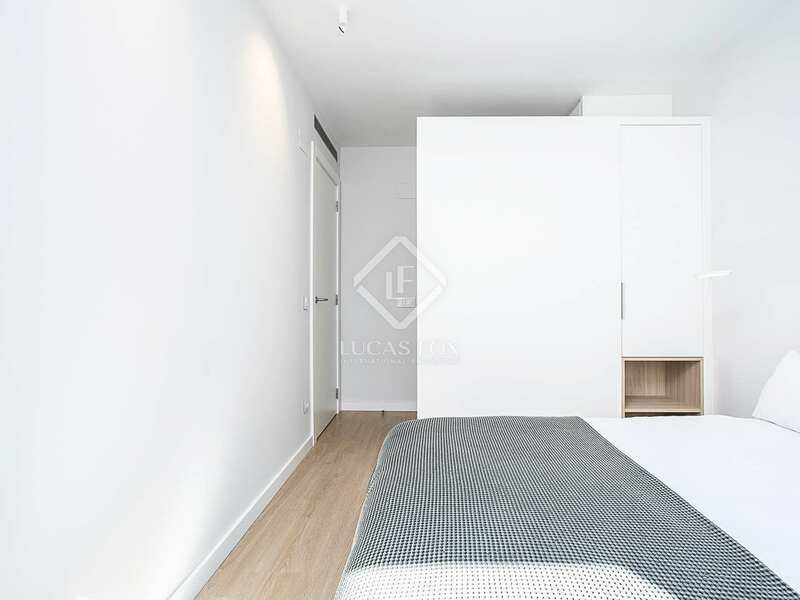 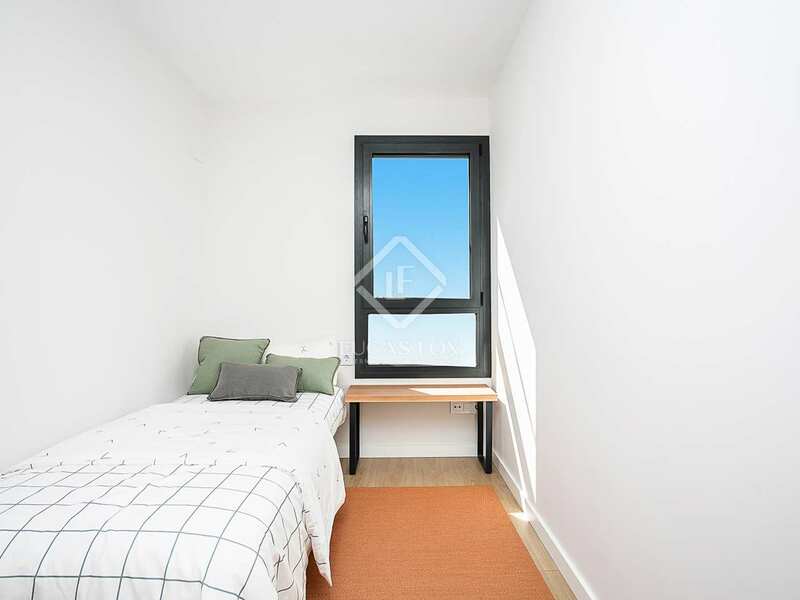 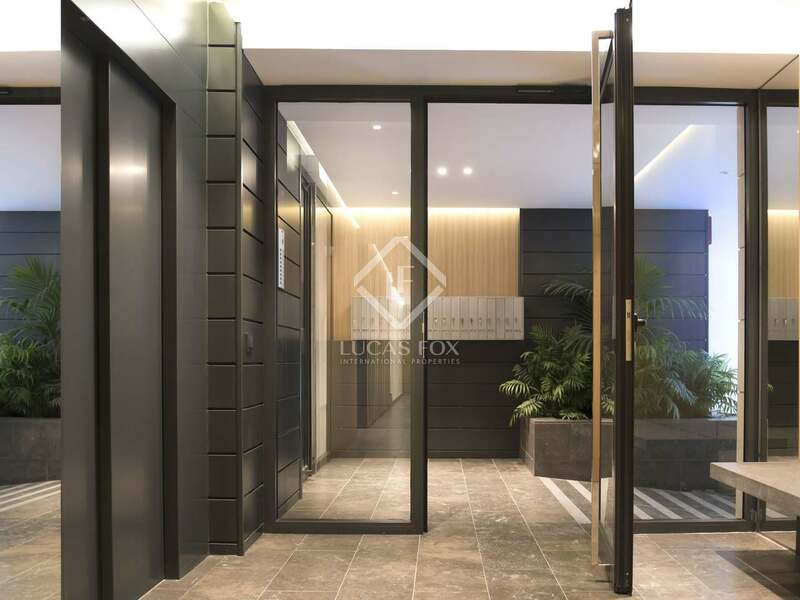 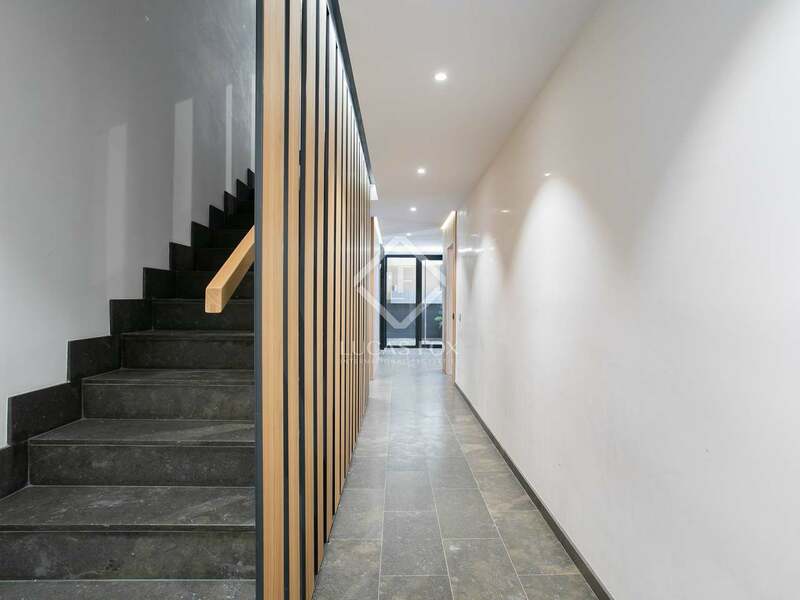 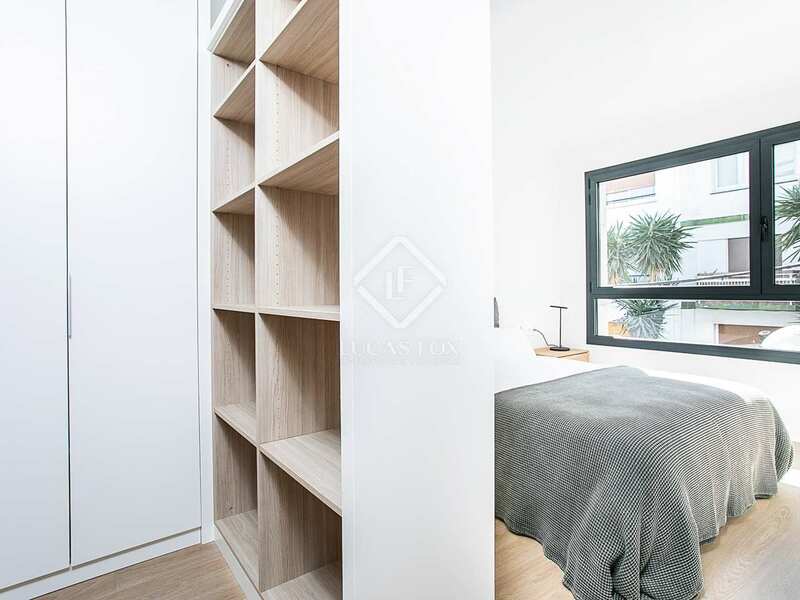 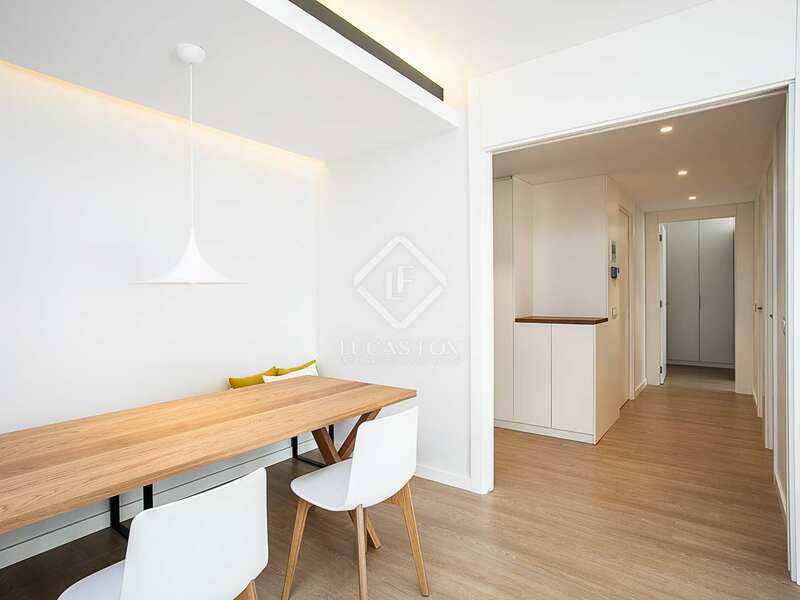 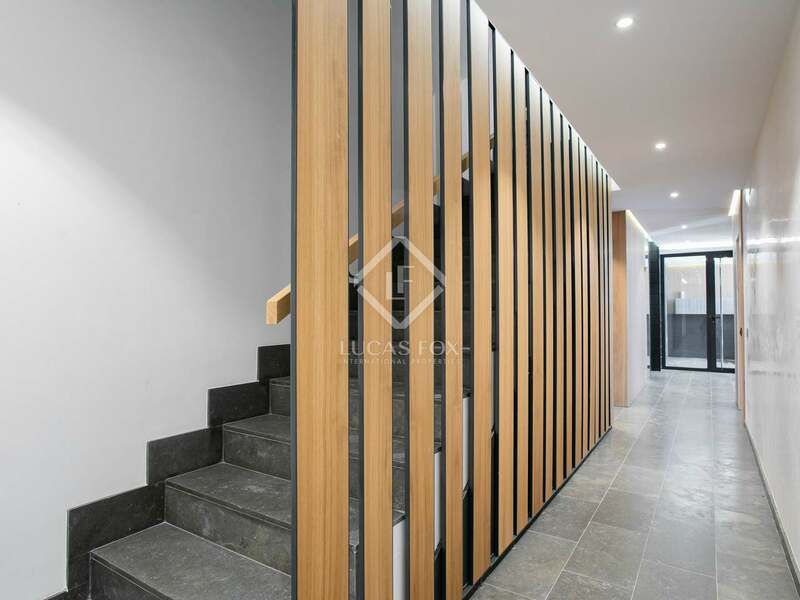 This apartment boasts high quality contemporary finishes throughout and is a sustainable home with energy-saving technology. 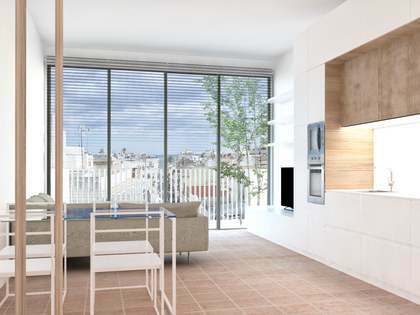 The open plan contemporary day area offers a living – dining room with glass doors leading out to the terrace. 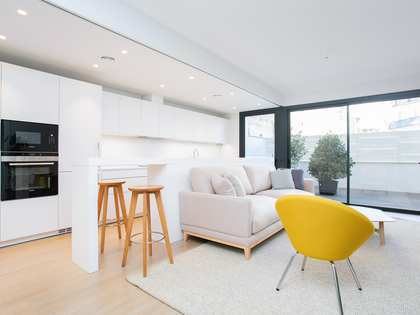 The open kitchen features a wall of cupboards and a bar separating it from the living area. 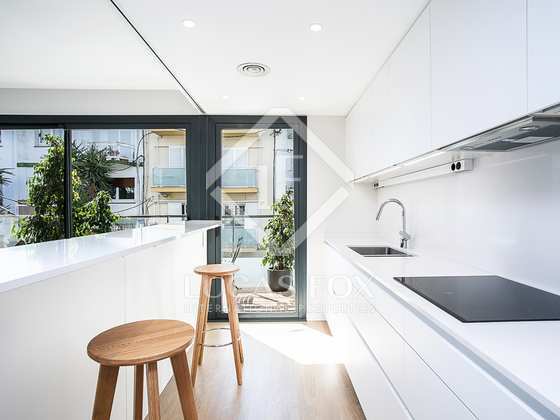 It comes equipped with a built-in Siemens oven and microwave and has a separate laundry area. 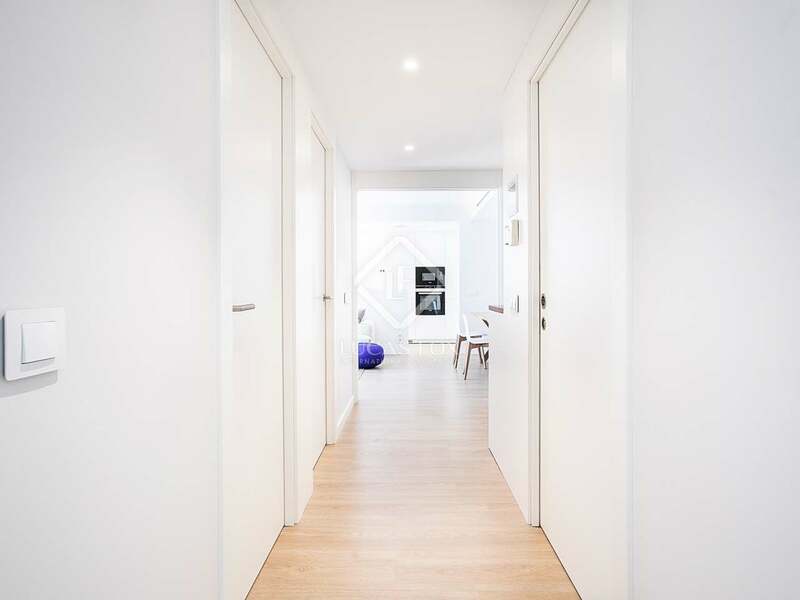 The hallway leads to a family bathroom, with a bath and shower, and 2 single bedrooms, one of which could be used as a study. 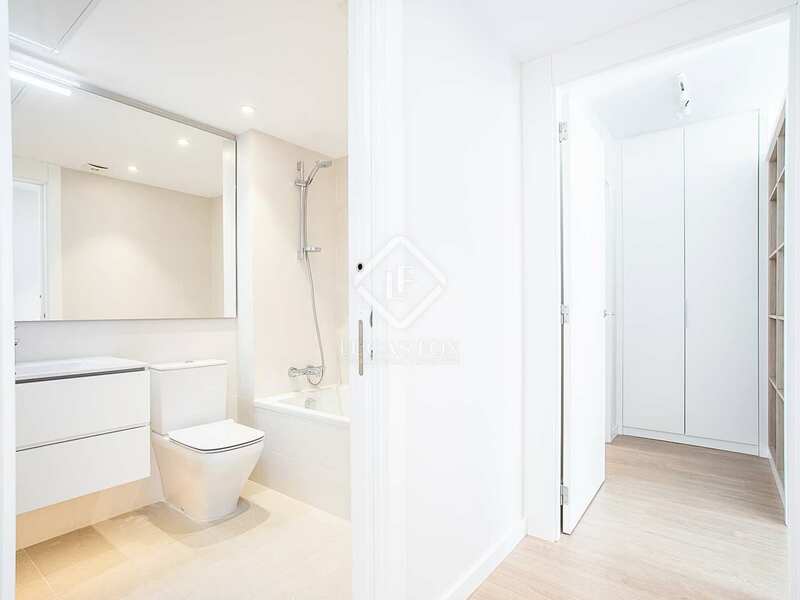 At the end of the hallway is the master bedroom with built-in cupboards and an ensuite bathroom with a rain shower. The buyer has the possibility to acquire this apartment already furnished as well as enjoying the option to buy a secure parking space in the same building. 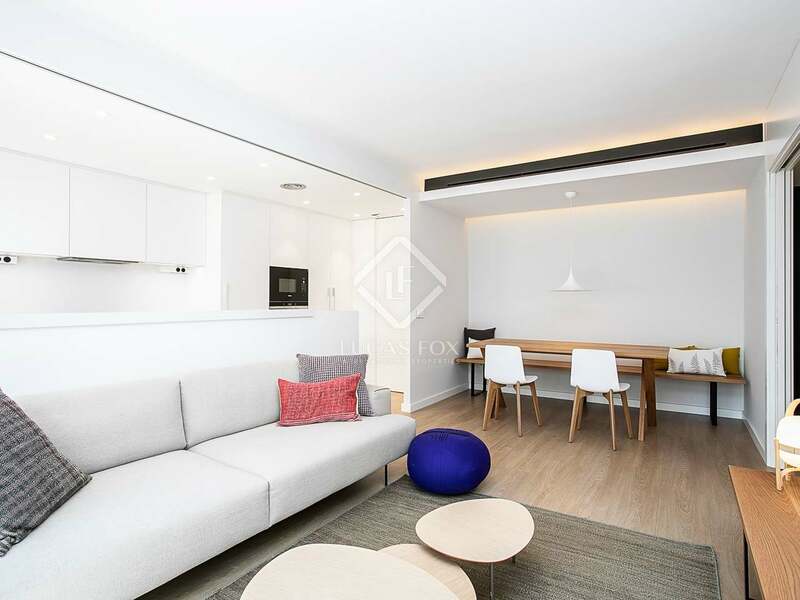 This property would appeal particularly to buyers looking for a primary residence as well as a perfect second home in the centre of Sitges. 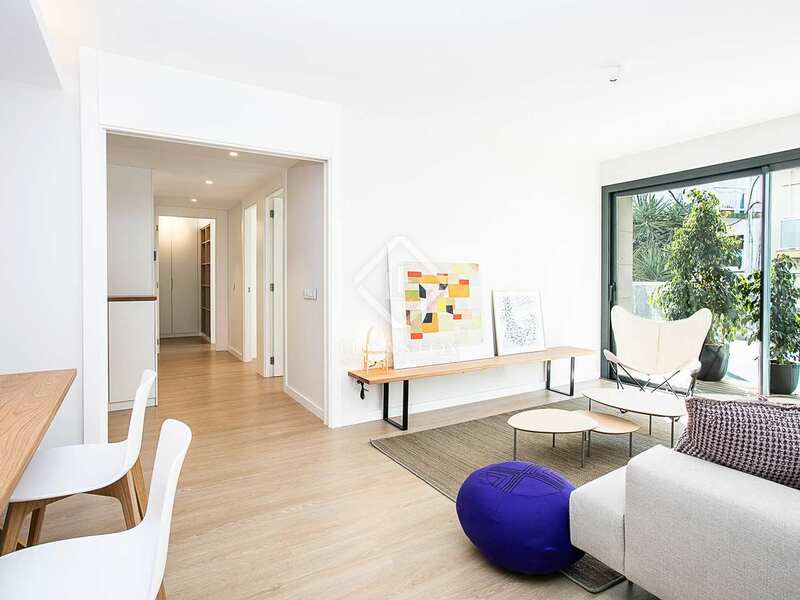 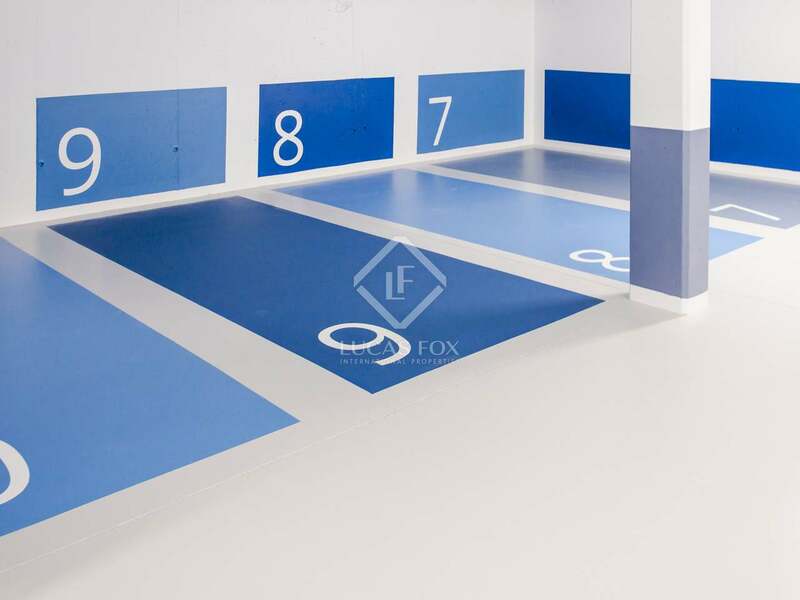 It would also be of interest for investors looking to gain a healthy return on their investment. 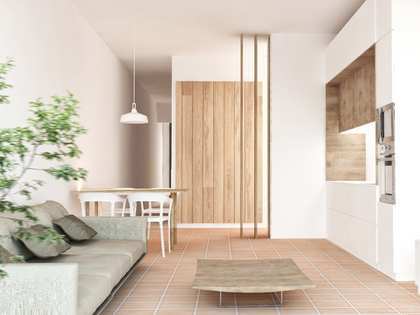 A remarkable opportunity to acquire a fabulous new energy efficient home with immaculate contemporary interiors and one of the best locations in the centre of wonderful Sitges. 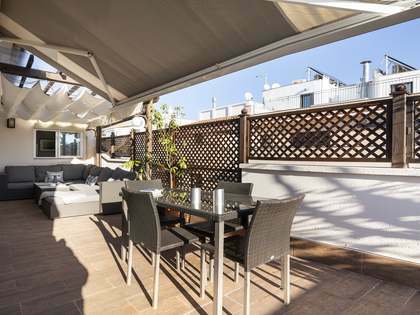 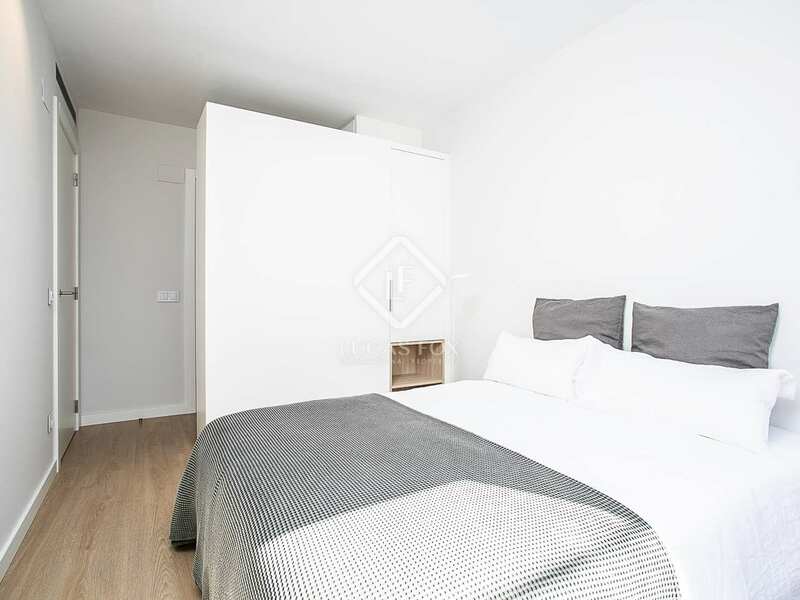 Maragall 7 is located in a quiet street in the Sant Sebastian area of Sitges town just one street back from the beach and a couple of minutes from the lively town centre. 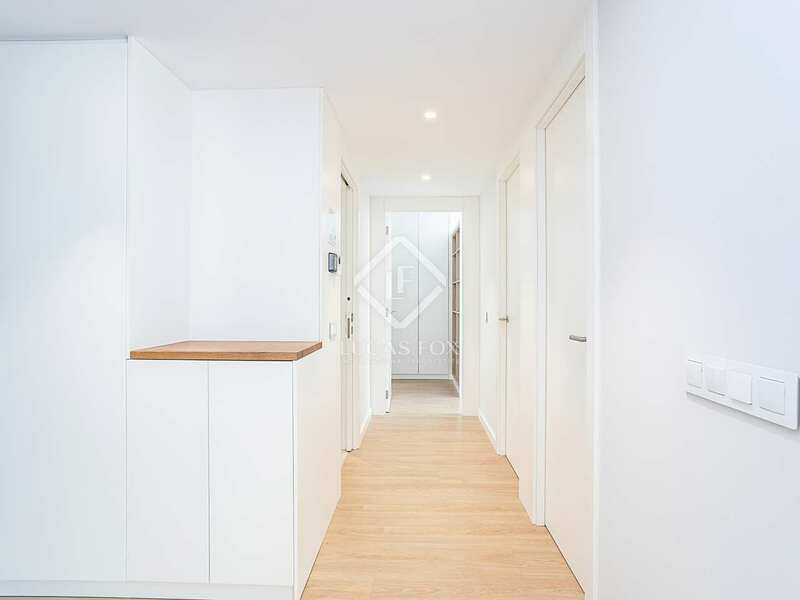 The train station, supermarkets, health centre, shops, bars and restaurants are all just a few minutes walk from the building.